Whether your child is a seasoned singer or “just loves to sing”, the Edmond Youth Chorus is an outstanding opportunity and privilege for members. Students from all over Edmond have been singing, learning and making friends in the Edmond Youth Chorus for 30 years. The Edmond Youth Chorus is an auditioned, honor chorus for boys & girls in the 4th to 8th grades in the fall. The 2017-2018 season is August 28, 2017- May 6, 2018 with the first performance in fall and a Spring Concert in March with approximately one performance a month. Annual Tuition: $426 paid in two payments of $213 OR A 10% discount is given for tuition paid in full. Discount on tuition only. Tuition includes 2 *OKC Thunder tickets. *Thunder ticket prices have not been determined, additional costs for Thunder tickets may be incurred once EYC game dates are announced. Additional tickets can be purchased through the team ticket offices. 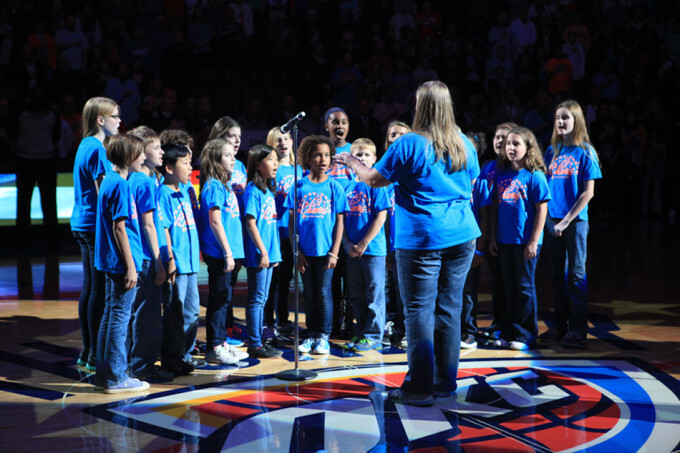 Tuition must be paid in full before students can perform at Thunder games. An Edmond Youth Chorus uniform, t-shirt and black flat shoes are required. Auditions for the Edmond Youth Chorus are “friendly”! Children are asked to sing a familiar tune and will be given music patterns to sing. Four children sing together and individually during the five-minute audition. Singers do not need to have anything prepared for the auditions. Director, Leah McDonald, music teacher at Cross Timbers elementary, “is passionate when it comes to music and children and we are thrilled she continues to share her talent with us,” states Shannon Price, Executive Director of the FAI. “I do my best to share with chorus members a lifelong love of music. Music and art enhance self-esteem, self-awareness and foster understanding between cultures,” says Leah McDonald. Chorus Members receive vocal instruction and learn a wide range of selected music such as contemporary, sacred, folk, patriotic, seasonal, and classical. New ideas and music are presented each year. Many children audition and remain in the chorus for four years. The chorus instills in its members the necessary tools to excel in the vocal music arena! Past performances include singing the National Anthem at the Oklahoma City Thunder game, Oklahoma City Festival of the Arts, City of Edmond Christmas Tree Lighting, combined concerts with the Canterbury Youth Chorus, Governor’s Christmas Tree Lighting and much more!